This excellent web site is full of lists ranking heads of states by hotness in various categories. The premiere ministre d'amour is of course at the top of the list of hottest current heads of state. 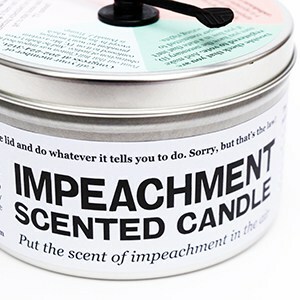 They also sell scented candles and while I was certainly intrigued by a Justin Trudeau-scented candle what really caught my eye was the impeachment-scented candle. They need to include a resignation-scented candle too, just in case.